HMC Furniture Ltd asked me to come up with a Mothers Day blog post so I thought I would put together a short guide for those of you who might be needing a last minute gift! Mothers Day is tomorrow for those of you who perhaps have been living under a rock over the last few weeks. So if today is your last chance to pop into town to rush off to find your Mum a decent pressie, check out these in store ideas I found. All come in at under £20 each which is ideal for those who maybe just need a small token gift for the morning. Don’t forget to buy a card too! Body and perfume gift sets will always be a winner when it comes to Mothers Day, and there’s some great offers running at Boots at the moment. Cath Kidston also have a promotion running where you can get a make up bag, mini mirror, and a wash bag set for only £18. And there’s lots of pretty floral prints to chose from! If your Mum is a chocoholic, why not get her a personalised gift from Thorntons? I love these individually iced truffles which come presented in a long box and they’re only £10 for 22 truffles. Perhaps your Mum likes pretty homeware, in which case a cute teacup or mug would make a lovely present. I love the sets by Pip Studio, and you could even bring her breakfast in bed with her new china set! Cosy socks are another fail-safe gift, although they don’t have to be boring. You can get some pretty jazzy patterened socks from Joules and they have an offer on for 3 pairs for £16.95 at the moment too! 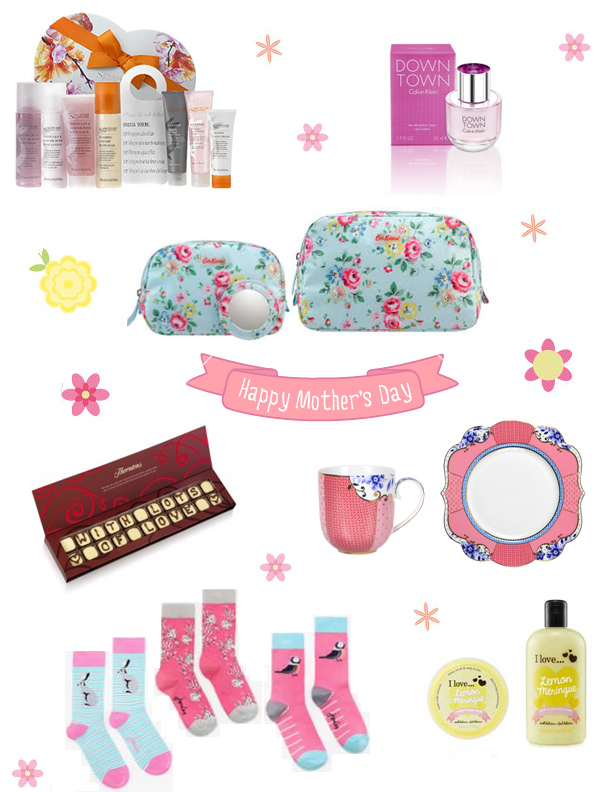 And finally, if your Mum likes a pamper why not treat her to a nice fragranced bath set? Superdrug do a range of beautifully scented ‘I love..’ products which would make lovely mini pressies! Thank you for this guide! I'm really struggling as I live in the USA and my mom is back in the UK and she won't give me any clues on what she wants me to send her! Lovely guide. I know Mother's Day has gone but my mums birthday is just over a week away so this has given me some great ideas :). THESE ARE LOVELY AND I REALLY LOVE WHAT YOU HAVE SHARED!